The best postseason baseball has ever seen? The St. Louis Cardinals celebrate after winning Game Six of the World Series. There is no shortage of storylines heading into the final game of the Fall Classic. On Friday night, the Texas Rangers will either hoist their first ever World Series trophy, or the St. Louis Cardinals will triumph for the 11th time in their storied history – good enough for second most all-time. Even if Game 7 is the most boring game in the history of baseball, this postseason will be remembered as one of the most exciting in history of the sport. Including the Cardinals' 10-9 win on Thursday, there have now been a record 13 one-run games in this year's playoffs. The teams with the best regular season records in their respective leagues (as well as my picks to meet in the World Series) – the Philadelphia Phillies and New York Yankees – were knocked out in the first round. To make matters even more exciting, both the Yankees and Phillies lost their decisive Game 5 by one run in their home parks. In fact, three of the four Division Series match-ups went to a decisive final game. Only the Rangers advanced with a game to spare. The Championship Series didn't disappoint either. The Rangers' Nelson Cruz hit the first game-ending grand slam in postseason history in an 11-inning Game 2 triumph over the Detroit Tigers. Cruz dealt another crushing blow to Detroit with a three-run home run in the 11th inning of Game 4. After losing Game 1 to the Milwaukee Brewers, the Cardinals had star first baseman Albert Pujols to thank after his memorable four hit, five RBI performance evened the series. Quite remarkably, that performance was not even close to what Pujols accomplished in Game 3 of the World Series. The Dominican launched three home runs, drove in six runs and finished with a total of five hits – all three stats tying a World Series record. The Cardinals weren't done tying records. Their remarkable Game 6 comeback was just the third time a team that was one out from World Series elimination came back to win the game. 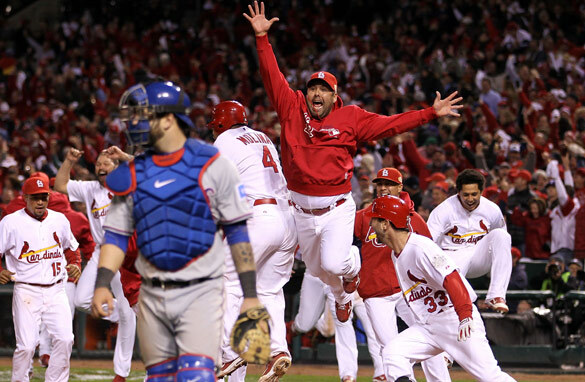 Will that incredible triumph propel the Cardinals to their first Series title since 2006? We'll have to wait and see. To neutral observers it really doesn't matter. This postseason has already provided us with drama we may never see again.